Painted in 1880, this portrait of former Member and Chief Justice of the United States John Marshall is a copy by Richard Brooke after the portrait by William D. Washington in Virginia's Fauquier County Courthouse. 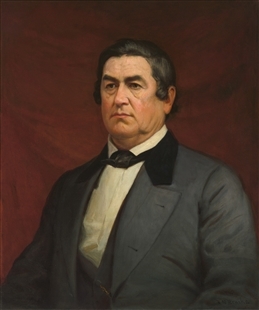 The portrait shows Marshall in his judicial robes and seated on a raised dais. It is a pose reminiscent of 17th- and 18th-century European court portraiture. Official papers and an inkwell rest at his elbow, while a scattering of legal volumes tumble down the carpeted stair. 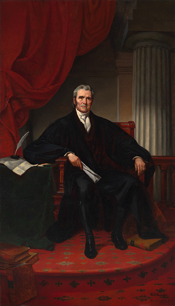 From the Blog: John Marshall, One of a Kind?